Dhruv Munjal reports from Modinagar. Yogender Pal Singh doesn't look a day older than 70. He will turn 80 later this year, but locals in Patla, a verdant village overlooking the Hindon in Uttar Pradesh's Modinagar, tell me that he works with the same verve he did 20 years ago. Singh roams around with a walking stick and is seemingly accompanied by the aura of a stern grandfather. Thankfully, he is anything but. He smiles through his meetings with villagers, listening to their problems patiently. Singh was chairman of the local municipal body for a decade, finally retiring from administrative life almost 10 years ago. Even today, villagers come looking for him to seek opinion, or ask for a favour. But over the last few days, people have had a completely different reason to visit him: An unusual curiosity. Singh and his wife, Atar Kali, want to adopt Prime Minister Narendra Modi. 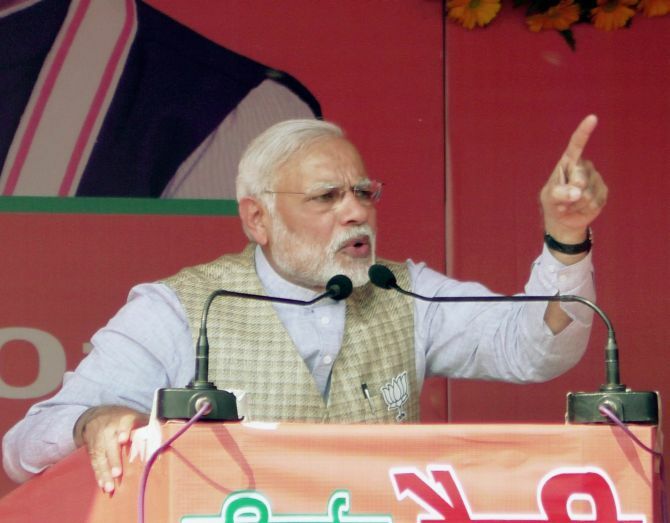 In February, Modi, while addressing a rally in Hardoi, had called himself UP's 'adopted' son. 'I was born in Gujarat but UP has adopted me... and it is my duty to work for you,' the prime minister had said. What should have been passed off as an innocuous piece of election rhetoric soon took a serious turn. Nihad Lari Khan, a member of UP's child rights panel, asked Modi to produce documents that could prove his adoption in the state. Singh and his wife promptly agreed to grant Khan his wish, filing adoption papers at the office of the Ghaziabad deputy registrar on February 21. The application was swiftly turned down. "We did all of this out of love. I have no political ambition or agenda. I thought if Modi can do so much for us, this is the least we can do for him," says Singh, dressed in a white kurta-pyjama and black cardigan. His silver hair are neatly combed and he sits upright in his chair, showing little signs of fatigue from an early morning visit to a local school where he was handing out awards at the annual sports day. "These days, he is running a fever most of the time. But that doesn't stop him from fulfilling his commitments," says Arun, his youngest son. Singh is all praise for Modi. "He is putting India first, setting examples for others. This is how a prime minister should be," he says. Singh's septuagenarian wife has been staunchly supportive of her husband's decision to 'adopt' Modi. The couple has four children -- three sons and a daughter -- but this is something they still wanted to do. "For us, there was never any greed. Our attempt to adopt Modi was just goodwill; there were no hidden intentions," says Kali, who only makes the occasional appearance in the family living room, which is a commodious space with several sofas and elegant white tiles. A portrait of Swami Vivekananda adorns one of the walls. In his younger days, Singh worked closely with Choudhary Charan Singh. In the background is a grainy photograph of Singh applying tilak on the forehead of his mentor. "This was taken the day he took oath as prime minister in 1979. He summoned me all the way to Delhi just to apply tilak. It is my most cherished memory of him," says Singh, eyes gleaming with pride. He even dabbled in electoral politics once, contesting the 1980 assembly elections on a Dalit Mazdoor Kisan Party ticket from neighbouring Muradnagar. He lost by 4,000 votes and never ventured into electoral politics again. "Over the years, I've distributed several tickets, but never wanted one for myself after that election," he laughs. "I chose to serve people without contesting." It is easy to see why Singh is held in such veneration in Patla. The roads leading up to village are slick, the area is surprisingly clean and populated by well-built houses -- things, locals say, achieved during Singh's tenure as nagar palika chairman. As for Modi's adoption, Singh says that he plans to take the matter to court. "We are a little disappointed but we will keep trying." If Singh and his wife do get their wish, the place where they live will be called Modinagar for more reasons than one. Guess how many days NaMo spent on the poll trail?